When measuring future global energy growth, two countries rise above the rest in size and importance: China and India. The two countries, world leaders in population size, will be crucial drivers in world economic growth and the consumption of energy. But measuring future trends with any accuracy has been a difficult prospect for organizations like the U.S. Energy Information Agency (EIA), which released a report on China and India on November 21. China’s economic growth has been continually revised by the EIA over the years. In 1990, it was estimated that China’s economy would grow by 4.5 percent between 1990 and 2000. In fact, China achieved an average of 10.4 percent per year during that time, and maintained that rate between 2000 and 2010. A peak rate was reached in 2007 when the Chinese economy grew by 14.2 percent. Its growth rate has subsequently slowed, with 2016 seeing the slowest rate (6.7 percent) in twenty-five years. The EIA’s total energy consumption projection for China was consequently way off target: 33 quadrillion Btu in 2010, as opposed to the 100 quadrillion Btu it averaged that year. The increase in energy consumption will come from improved living standards and higher per capita income, as the Chinese middle class continues to grow and residential energy consumption climbs upward. The industrial sector, which was a strong driver of overall energy consumption growth during China’s economic boom between 1990-2010, will see fairly flat growth. Transportation will also account for significant energy consumption growth. 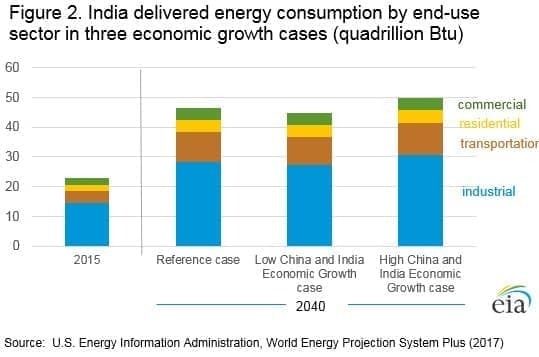 India consumes far less energy than China: 28 quadrillion Btu in 2015. Yet it’s projected to grow at a faster relative rate, consuming 61 quadrillion Btu in 2040, an increase of more than one-hundred percent. With a population that will surpass that of China by 2025, India will consume less than half the energy, though its per-capita income will expand at a rapid rate. Like China in the 1990s and early 2000s, the main driver of India’s future energy consumption will be the industrial sector. Yet the sector with the fastest projected growth rate is transportation, which accounts for 28 percent of total energy consumption and will grow at an annual rate of 4.0 percent between 2015 and 2040. By comparison, the industrial sector will grow by 2.7 percent. There will be strong growth in commercial and residential sectors as well. Real GDP growth is projected to average 5.4 percent between 2015 and 2040. 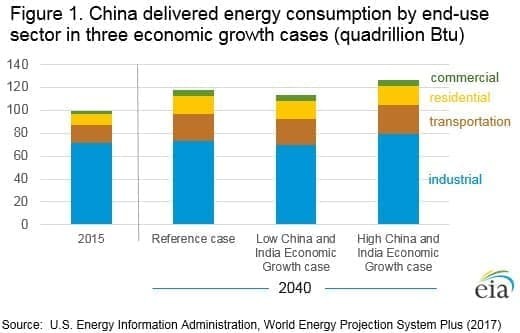 China, by contrast, will account for twenty percent of total global energy demand growth. The ‘gorilla’ of global energy, in the words of one Bloomberg analyst, will continue to consume energy in massive quantities, as it tilts away from reliance on coal towards cleaner alternatives, like natural gas, renewables and hydroelectric. India also relies on cheap coal and may turn toward alternatives like LNG. The government plans to increase the natural gas share to 15 percent of total energy consumption by 2030, from its current level of 6.5 percent. Most of this will come from imports: India may become the largest LNG market on earth, as it increases imports from 19.7 million tons to more than twice that, if targets are reached. Predicting Chinese and Indian growth is, of course, something of a guessing game. The good news for energy markets is that as each country moves away from coal, reliance on imports will grow, feeding demand for LNG and crude and driving global energy demand well into the twenty-first century.